XANGAI — O edifício principal de um templo budista de Xangai de 135 anos — o “pavilhão Mahavira”, que pesa quase duas mil toneladas — foi deslocado em 30 metros. A medida foi tomada para proteger o local, evitando o risco de incêndio, relativamente elevado com o grande número de varas de incenso. O templo do Buda de Jade — que recebe milhares de visitantes por dia — foi colocado sobre trilhos especialmente concebidos para a operação e deslocado lentamente, com o objetivo de abrir mais espaço nas zonas adjacentes. Os operários injetaram cimento nas fundações da edificação para reforçá-lo, antes do deslocamento. A operação terminou no domingo, após duas semanas. 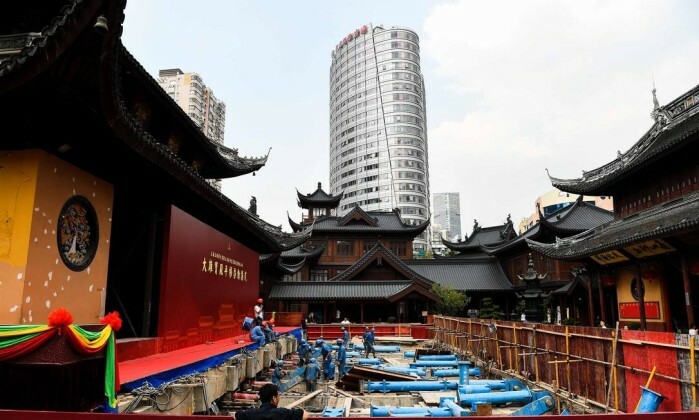 As estátuas do pavilhão foram protegidas previamente e seguiram junto com o edifício, segundo o “Diário do Povo”, jornal oficial do Partido Comunista da China. 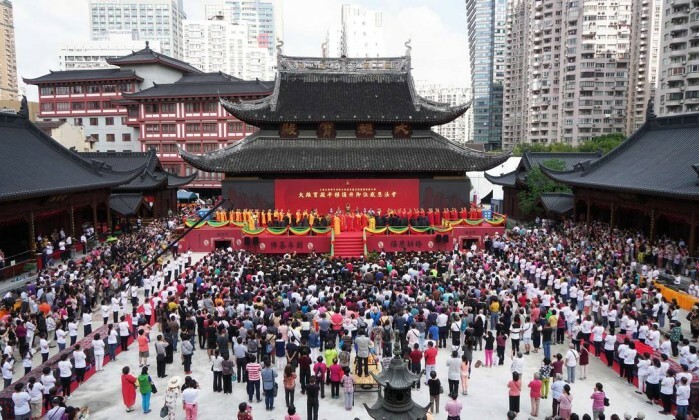 É possível ver o templo sendo movido em imagens divulgadas pela Rede Global de Televisão da China (CGTN, na sigla em inglês). O vídeo, publicado no Twitter da emissora, mostra o deslocamento do edifício a partir do último 2 de setembro. A operação é parte de uma campanha iniciada em julho de 2014 para responder às “preocupações em termos de incêndio e segurança do público”, informaram os diretores do templo, construído em 1882. The Swiss police were acting jointly with the FBI; then-FBI director James Comey described the defendants as having “fostered a culture of corruption and greed.” As Conn recounts in The Fall of the House of FIFA, much of the investigation, which had begun by 2011, concerned FIFA’s choices of Russia to host the World Cup in 2018 and Qatar in 2022. Murky payments continue to surface. To many observers, the dawn raids were reassuring: the US, as the world’s policeman, could still catch international outlaws. But two years later, things look different. FIFAremains largely unreformed, and Western countries seem powerless to force change. Conn is longer on reporting than analysis. However, his book shows that the saga of world soccer’s governing body since the 1970s has foreshadowed geopolitical shifts, notably the waning of the political and economic dominance of the West. Most modern team sports were codified in Victorian Britain, partly in the hope of distracting schoolboys from masturbation. But the British saw little point in playing against foreigners, and many major international sporting bodies were created by the French. The Fédération Internationale de Football Association was founded in Paris in 1904 by seven continental European countries. FIFA controlled the rules of soccer and oversaw national federations. Yet it was always a weak regulator, with little say over professional clubs. Its power derived from its one prestigious property: the quadrennial men’s World Cup, first played in Uruguay in 1930. In 1932 FIFA’s headquarters moved to neutral, centrally located Switzerland. Into the 1970s FIFA remained a European gentlemen’s club, led by elderly men who believed in Victorian ideals of fair play and amateurism. Sir Stanley Rous, the British sports teacher who became FIFA’s president in 1961, did the job unpaid. Women’s soccer was discouraged: England’s Football Association actually banned it from 1921 to 1971. After decolonization, Asian and African countries joined FIFA. Rous—a protector of apartheid South Africa—didn’t notice the wind of change. In 1974 the Brazilian businessman João Havelange, campaigning on a third-worldist platform, defeated him in an election for president of FIFA. Rous retired, refusing a pension, and rejecting as egotistical the idea of naming the World Cup trophy after him, according to the sports historian David Goldblatt. But Havelange was aware of the power of media, and during his reign television transformed soccer. He realized that there is something about soccer that allows it to make converts in any society. Already a century earlier, Britons had exported the game with startling rapidity. To cite just one example, in 1889 the twenty-one-year-old Englishman Frederick Rea landed on the isolated Scottish island of South Uist to work as a headmaster. A couple of years later two of his brothers visited, bringing along a leather ball. Within two decades soccer had conquered South Uist. Shinty, a stick sport that had been played there for 1,400 years, “was wiped like chalk from the face of the island,” Roger Hutchinson, a British author, has written. Soccer was cheap to play and simple to understand, yet tactically sophisticated. Its displays of physical grace evoked dance. Watching a great player like Argentina’s Lionel Messi, you can witness human genius of a type that’s easier to comprehend than, say, Einstein’s or Picasso’s. Traditionally, each country had its own playing style, which was widely felt to reflect national character: England’s warrior-like effort or Brazil’s light-footed dance. When their team played at the World Cup, citizens of a given country felt their nation was embodied. Those eleven young men in plastic shirts were more alive than the flag, more tangible than the gross domestic product. The nation embodied itself on the sofa too: in many countries, the most-watched TVprograms ever are the national team’s games at World Cups. Love of the sport has always mingled with the quest for national prestige. The World Cup provides an alternate global status ranking, in which the US has been an also-ran and Brazil a superpower. Rulers since Mussolini have latched onto their winning team’s prestige. In recent years, as the sport has spread to every corner of the earth, countries that could never win the tournament have dreamed of hosting it. Beginning in the 1980s, Havelange expanded the tournament, creating more places for Asian and African teams. And so the rights to broadcast and sponsor the World Cup became ever more valuable. But Havelange’s tiny FIFA staff lacked the skills to market them. (In 1974, the organization’s Zurich headquarters had twelve employees.) Horst Dassler, whose father had founded the soccer shoe manufacturer Adidas, a much larger operation than FIFA, bought many rights directly from Havelange. Dassler paid him kickbacks, and the Brazilian flew suitcases of cash first-class between Rio and Zurich. Nobody troubled Havelange. Few journalists covered sports administration. Equally important, Switzerland, with its tradition of discretion and bank secrecy, barely regulated sports associations based on its soil. Swiss authorities treated FIFA almost as if it were a village hunting club. (Dozens of other sports federations, including the International Olympic Committee, chose to set up in this forgiving and efficient country. Many of them became corrupt too, while a caste of Swiss administrators arose to staff them.) In 1975 the young Sepp Blatter, a workaholic protégé of Dassler’s from the rural Valais region, became FIFA’s technical director. In 1998, when Havelange retired, FIFA’s congress in Paris elected Blatter his successor. The president of each national soccer federation has one vote in the congress, Montserrat (population 4,900) in the Caribbean the same as China. Many national soccer federation presidents have proved corruptible. David Yallop, in his 1999 book How They Stole the Game, recounts how the emir of Qatar (then a little-known country) flew $1 million in cash on a private jet to Paris, where twenty voters would each seem to have been handed envelopes stuffed with dollars. That election set the template for Blatter’s rule. World Cups kept generating more money: FIFA’s revenues rose from $308 million in the four-year cycle through 1998 to $5.7 billion in the four years through 2014. This was largely because in an interconnected world, people from China to the US were now watching soccer. Blatter nevertheless took credit for “developing” the game—FIFA’s supposed mission. He passed on chunks of the loot to national and continental soccer barons, in payments that were typically couched in the language of “development.” A FIFA grant, often handed over by Blatter’s staff on the eve of a FIFA presidential election, was supposedly meant to fund facilities in the official’s country. Indeed, some national federations, especially in Africa, couldn’t even afford a phone line. But these payments were not monitored, and if the official slipped the money into his jacket pocket, nobody would complain. The unmatched milker of this system was the Trinidadian Jack Warner, who rose from poor college teacher to global soccer power broker. Warner assembled a block of thirty-one mostly tiny Caribbean national associations. In a congress of a little over two hundred countries, this group was often the swing vote. And so, as Conn documents, Warner received at least $26 million from FIFA to build a Dr. João Havelange Centre of Excellence in his home country, on land that later turned out to be his. (Now banned for life from soccer, Warner still lives prosperously in Trinidad.) FIFA could afford the waste, because its costs were low, beyond paying its four hundred officials their secret salaries and first-class flights. FIFA takes almost all TV and sponsorship money for World Cups, while the host country pays for the required infrastructure. Little of the money sent to Warner was used to build fields for ordinary people to play on or safe stadiums where they could watch games; Trinidad’s own standing in the world of soccer improved little. Warner preferred to use his center to host more profitable “weddings, dinners, shows,” writes Conn. It’s a pattern replicated in many poorer countries. One reason why Western Europe, with just 5 percent of the world’s population, produced the last three world champions is that it’s the only region on earth where most children grow up with good soccer fields and coaches in their neighborhoods. Social democracy wins World Cups. Elsewhere, many senior soccer officials grew rich. They tended to see this as just rewards for being members of what Blatter called “the football family.” Most came from countries where this was how politics and business had always been done. By 2015, when Blatter was forced to resign—a year in which FIFA itself had revenues of $1.15 billion—his secret base salary was three million Swiss francs a year. Yet the ideal emotional crescendo of FIFA’s corruption scandals—Blatter’s indictment for pocketing bribes—has never happened. In any case what Blatter cared about was not money but power. In outward appearance, the pudgy beaming Swiss was like an embarrassing uncle, always popping up to say something fatuous and old-fashioned, such as urging women players to wear tighter shorts, when he wasn’t spouting Victorian pieties about fair play. Underneath, he was a master politician who built a model patronage system. He ensured that people around him were corrupted. If anyone dared challenge him, FIFA’s ethics machinery—which Blatter controlled—would expose the challenger’s corruption. Crucially, Blatter saw early on that global power was shifting eastward. It helped that he himself came from a small country used to dealing with larger powers. He is a recognizably Swiss type: the hotel concierge, der Portier in German, is friendly, multilingual, and unideological. He always remembers his guests’ names. Above all, der Portier knows which of them have money: in the nineteenth century the British, later the Americans, then the Russians, and currently the petro-states of the Arabian Peninsula. Qatar in particular—a hereditary monarchy that has no tradition in the sport but huge natural gas fields that have given its ruling family, the al Thanis, extraordinary wealth—emerged during Blatter’s reign as a major funder of global soccer. Many observers in the once-dominant Western European and American countries noticed these power shifts only on December 2, 2010, when FIFA’s executive committee (ExCo) gathered in Zurich to vote on the hosts of the 2018 and 2022 World Cups. Contenders included the US, England (the British nations operate separately in soccer), Australia, and a joint Spanish-Portuguese bid. However, the twenty-two male, mostly ageing ExCo members (two others had been suspended for alleged corruption before the vote) chose Russia and Qatar. We now know that Vladimir Putin personally met half a dozen of them in the months before the vote, but Qatar’s victory was more surprising. Mikhail Klimentyev/RIA Novosti/Kremlin/Reuters Russian President Vladimir Putin and FIFA President Sepp Blatter discussing the 2018 World Cup, Moscow, October 2014. At left is Russian Deputy Prime Minister Igor Shuvalov; at right is Russian Sports Minister Vitaly Mutko. Qatar quickly showed that it was a rising power well beyond soccer. Fifteen days after the ExCo vote, popular uprisings began to spread across North Africa. As Kristian Coates Ulrichsen, a Gulf analyst at the Baker Institute, describes it, Qatar’s rulers, “flush with the success of winning the rights to host the…World Cup and with its international recognition soaring as a result,” then helped spread the Arab Spring—as long as it didn’t threaten the monarchies of the Arabian peninsula. Qatar funded North African Islamists and helped unseat Libya’s Muammar Gaddafi. A few years later, Russia’s determination to assert its power surprised the West again when Putin annexed Crimea in 2014, and again when he meddled in the 2016 US election almost as if it were a World Cup vote. Yet FIFA’s embrace of this geopolitical shift carried risks, and Blatter had not wanted Qatar as host for 2022, backing the US instead. Now eighty-one and unwell, he told Conn in his inimitable Swiss-English, over an oddly touching lunch in Zurich, how he felt pulling Qatar’s name out of the winner’s envelope: “Look at the picture. I haven’t had a very smiling face.” Jérôme Valcke, Blatter’s secretary-general—now banned from soccer, like so many characters in Conn’s tale—had remarked privately before the vote, “If it is Russia and Qatar, we are finished.” Observers in Europe and North America would conclude that the votes were based on bribery. After the vote, Valcke wrote in an e-mail that Qatar had “bought” the World Cup. When it was leaked, he said he had been misinterpreted. The FBI’s stool pigeon was Chuck Blazer, who had discovered the sport in the 1970s as a “soccer dad” in Queens, New York. Conn first met him in 2009, in the self-proclaimed “seven-star” Emirates Palace Hotel in Abu Dhabi, where the obese Blazer was whizzing along marble floors on his mobility scooter. Blazer suggested to Conn (falsely) that he had gotten rich inventing the ubiquitous yellow “smiley faces,” often seen in the form of stickers before the age of computer emoticons. In fact he had gotten rich as the corrupt secretary general (under President Warner) of CONCACAF, the regional soccer confederation for North and Central America. Conn reports that Blazer eventually inhabited an entire floor of Trump Tower in Manhattan, keeping one apartment just for his cats. But one day in 2011, as Blazer tooled down East 56th Street on his scooter, the tax authorities tapped him on the shoulder. Soon he was back on FIFA’s luxury hotel circuit, but now as an FBI informer, carrying a recording device “in his key fob, reportedly because he was too obese for a wire to be run in the standard way up his stomach,” Conn writes. Blazer died in July of this year, aged seventy-two. The FBI and others uncovered corruption in World Cup bids far into the past. It now seems that Germany paid bribes to host in 2006, as did South Africa in 2010. Warner, Blazer, and a co-conspirator got a $10 million payment from South Africa, disguised as support for the Caribbean’s “African diaspora.” Warner also insisted that an ailing eighty-five-year-old Nelson Mandela fly to Trinidad to beg for his vote. Corruption stories keep emerging. In June, a 430-page report on World Cup bids that was delivered to FIFA’s ethics committee in 2014 was leaked to Germany’s Bildnewspaper. FIFA, which had kept the report secret for three years, then instantly published it, claiming “transparency.” The report, by the American judge Michael Garcia, alleged that a consultant for Qatar who himself has been charged with money laundering, Sandro Rosell, sent £2 million to the ten-year-old daughter of the famously avaricious Brazilian ExCo member Ricardo Teixeira, Havelange’s former son-in-law. Still, the report noted: “No proof exists linking Qatar and this £2 million.” The Garcia report also found that just after Qatar was named host, a former ExCo member thanked Qatari officials by mail for a transfer of several hundred thousand euros. Qatar undoubtedly sprinkled money and favors on soccer officials, but so did most other bidders. The Western European and American contenders just took care to sprinkle legally. 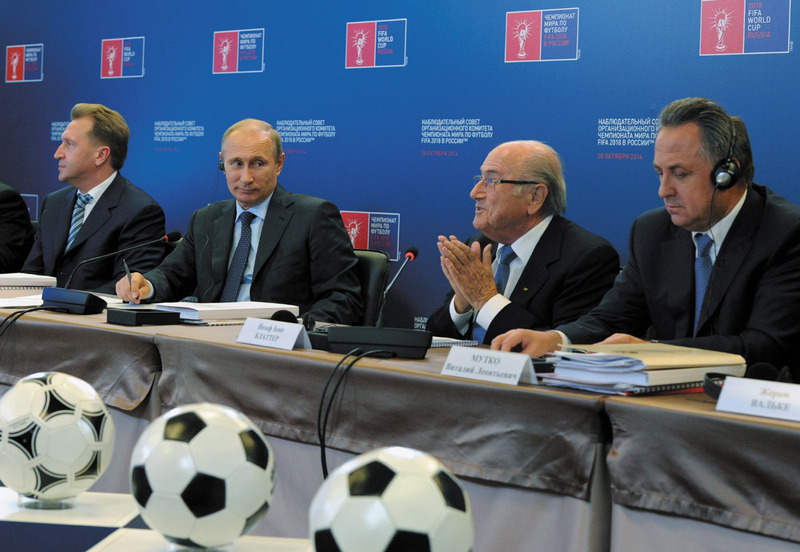 For many ExCo members, bribes were the whole point of World Cup voting. Corruption was FIFA’s system. Yet Qatar got much of the blame. Conn attributes this partly to anti-Arab racism. But to explain the Qatari triumph by bribery alone is to overlook Qatar’s considerable soft power, in its extensive economic ties with the West, especially after the 2008 financial crisis. In fact, ExCo’s 2010 vote was probably decided at a lunch a few weeks earlier in Paris’s Elysée Palace. Around the table were France’s then president Nicolas Sarkozy, the Qatari emir’s son, and Michel Platini, the Frenchman who headed the European soccer association UEFA. Platini had walked into the Elysée planning to vote for the US for 2022, but Sarkozy leaned on him to back Qatar instead. At stake were French-Qatari trade deals and a mooted Qatari takeover of the troubled French soccer club Paris Saint-Germain. Platini duly switched the block of four European votes from the US to Qatar, which decided the outcome. The next year, a wing of the Qatari state bought Paris Saint-Germain and funded its purchases of superstars. Better yet, the Qatari broadcaster beIN Sports—formerly part of Al Jazeera—agreed to pay an unprecedented €607 million a year for rights to French league games. Qatar is still subsidizing French soccer. BeIN—broadcasting in countries from Egypt to the US—may now be as significant an arm of Qatari soft power as Al Jazeera itself. And just to make everyone happy, Platini’s son, a lawyer, got a job at a sportswear company owned by the Qatar Investment Authority. This is part of a larger story of autocracies coopting Western elites. Soccer’s senior officials still sometimes buy non-Europeans, but increasingly often they are bought by them. After this barrage of scandals, Swiss police staged the raids in Zurich in 2015. Yet days later, while FIFA officials shredded documents at headquarters, the seventy-nine-year-old Blatter won his fifth presidential term in an election out of a Ruritanian farce. Some delegates photographed their supposedly secret votes for him as proof of fealty. By this point, the pressure from the press, the FBI, and Switzerland (fed up with being embarrassed by FIFA) had become unbearable. Four days after Blatter’s reelection, he resigned. In December 2015 he and Platini were banned from soccer. Their falls were in character: Blatter was found to have bribed Platini with two million Swiss francs. This fall, following the FBI’s investigations, the US Department of Justice will sentence or put on trial over a dozen mostly Latin American soccer officals. Swiss prosecutors are conducting about twenty-five separate investigations of suspected corruption linked to FIFA and World Cup bids. But most of the heat is now off FIFAitself. Hardly any journalists cover the organization regularly. The US may pipe down while it prepares a joint bid with Mexico and Canada to host the World Cup in 2026. And the Trump administration doesn’t seem very exercised about foreign corruption. Admittedly, the scandals have hurt: FIFA is struggling to fill sponsorship slots for the Russian World Cup. But the organization’s costs remain low, and it still operates much as it always did, though probably now with fewer Miami bank accounts. Most of the people who reelected Blatter in 2015 are still around, still seeking patronage. Putin is preparing his World Cup. 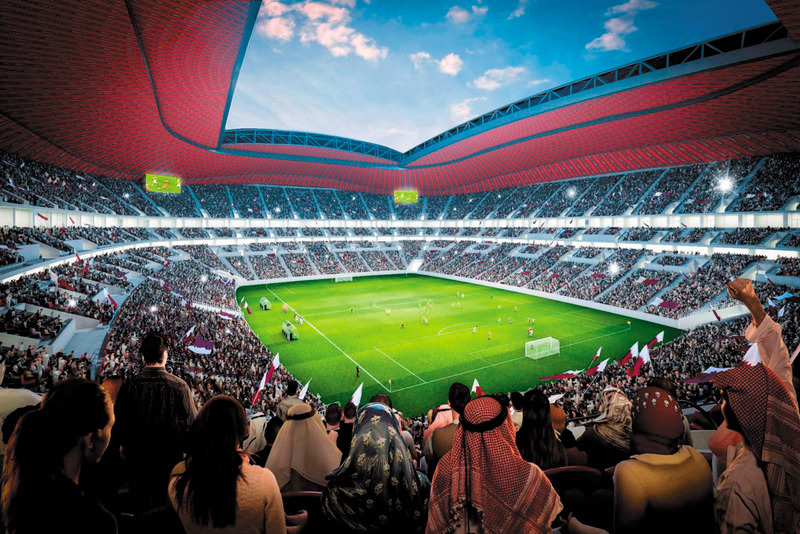 Qatar’s World Cup is a mammoth, time-sensitive project that is heavily reliant on imports and foreign labor. That puts the country at its neighbors’ mercy: the current economic blockade by Saudi Arabia and the United Arab Emirates is biting. Jealousy plays a part. The Saudis were slower than Qatar to realize soccer’s soft power. Only now are they creating a pan-Arab competitor to beIN. FIFA could end the standoff by making the 2022 World Cup a Gulf-wide event, spreading matches around Saudi Arabia, UAE, Kuwait, and others. That would reduce pressure on Qatar, encourage neighborliness, and push the whole Gulf to clean up its kafala systems as Qatar is now haltingly doing. A shared tournament could echo the successful joint-hosting of the 2002 World Cup by longtime rivals Japan and South Korea. It would back up FIFA’s rhetoric about soccer’s uniting humanity (the basis of Blatter’s longtime personal angling for the Nobel Peace Prize). Soccer is almost as powerful a global force as FIFA pretends it is, which is why the world’s rising nations have got their hands on it. Wang Shu was interviewed by Marc-Christoph Wagner at Louisiana Museum of Modern Art, Denmark, in March 2017. Until April 30th, the museum is exhibiting the work of Wang Shu. Until April 30th, the Louisiana Museum of Modern Art in Denmark is exhibiting the work of Wang Shu. The first in a new series of monographic exhibitions collectively titled “The Architect’s Studio,” this show of the work of the 2012 Pritzker Prize winner features an exhibition catalog that includes essays from Kenneth Frampton, Ole Bouman, Yiping Dong and Aric Chen. Louis Kahn’s Kimbell Art Museum is a masterclass in natural lighting, with thin-shelled concrete vaults that feature subtle openings to reflect light into the galleries below. While Kahn’s wing of the Fort Worth Museum opened in 1972, in 2013 a second Renzo Piano-designed pavilion was added to the complex. Piano was selected to design the addition because he had worked for Kahn as a budding architect, and the homage to his former mentor is evident in the building’s similar layout and use of translucent glass panels. In this video, architect-photographer Songkai Liu takes viewers on a serene stroll through the museum’s campus. Time-lapses and pans of Kahn’s concrete are juxtaposed with the clean details of Piano’s glass in a soothing exploration of the two complementary projects. When Renzo Piano’s addition to the Kimbell opened in late 2013, critical responses ranged from “both architects at the top of their games” (Witold Rybczynski) to “generous to a fault” (Mark Lamster) to “distant defacement” (Thomas de Monchaux). For architects, Louis Kahn’s Kimbell Museum has long been hallowed ground. For Renzo Piano, who designed the museum’s first major expansion, it was also an enormous difficulty to overcome. His addition to the museum could be neither too close to Kahn’s building, nor too far. O Conselho de Arquitetura e Urbanismo do Rio de Janeiro (CAU/RJ) estará em sua sede própria na próxima semana. A partir de 13 de fevereiro, o CAU/RJ passará a funcionar no 23º andar do Centro Empresarial Castelo Branco, situado na Avenida República do Chile 230, no Centro da Cidade. Excepcionalmente, no dia 13, o atendimento aos profissionais começará às 12h. Nesta sexta-feira (10/02), devido à mudança, não haverá atendimento. “A atual sede, um conjunto alugado na Rua Evaristo da Veiga, não oferece espaço para ampliação. Não proporciona aos arquitetos e urbanistas benefícios local adequado para a realização de eventos ou cursos, por exemplo. Além disso, o prédio em que estamos hoje não considera as normas de acessibilidade”, explicou Jerônimo de Moraes, presidente do CAU/RJ. No novo endereço, nos próximos meses, o CAU/RJ poderá oferecer aos profissionais e estudantes uma infraestrutura adequada com sala de aula, auditório. Entre os projetos está o de uma biblioteca especializada. Durante seis meses, uma Comissão formada por cinco conselheiros estudou em profundidade o mercado imobiliário e as condições de acesso à região central da cidade até encontrar a melhor alternativa. O Conselho canalizou parte dos recursos para aquisição e negociou um preço cerca de 30% abaixo do valor de mercado.